We knew from the start that we would need to replace the windows. They are universally fogged through and many have cracks in them – which reduces their efficiency tremendously. Although, they are double-pane with aluminum frames they likely were never very air tight. But overall the poor state of the windows represent an opportunity; since they need to be replaced anyway we can explore the relative cost and efficiency benefits of high performance versus run of the mill replacement windows. An example window from the south parlor floor. There are many kinds of windows on the market and choosing replacements is not so straightforward. On our house glazing composes 22% of the front and back surface area (for the moment I am excluding glazed doors). The air tightness and insulation value of the windows will have a significant effect on the thermal envelope of the entire house. Another ratio that is often used to understand the possible energy benefits or pitfalls of windows is south facing glazing/total square footage of livable space. The reason this ratio is interesting is because in certain cases a high ratio of southern glazing can contribute significantly to cold weather heating, decreasing overall energy expenditure. The flip side of this is that a high ratio of southern glazing can cause summer overheating – and increase energy expenditure in order to cool the house. It turns out that 6% south glazing is a pretty good ratio for a cold or moderate climate. High performance windows are designed to have either a high or low solar gain coefficient. A high solar gain coefficient means that a high percentage of solar radiation in the form of heat can be transmitted through the window. Alternatively a low solar gain means you can get all the light without the heat. In an ideal world we would have super smart windows with a high solar gain in the winter and low gain in the summer. But that doesn’t exist of course so instead we will choose moderately high solar gain in combination with some sort of summer shading. Shading is a great and much under-appreciated technology. We will use deciduous trees and, maybe, awnings. 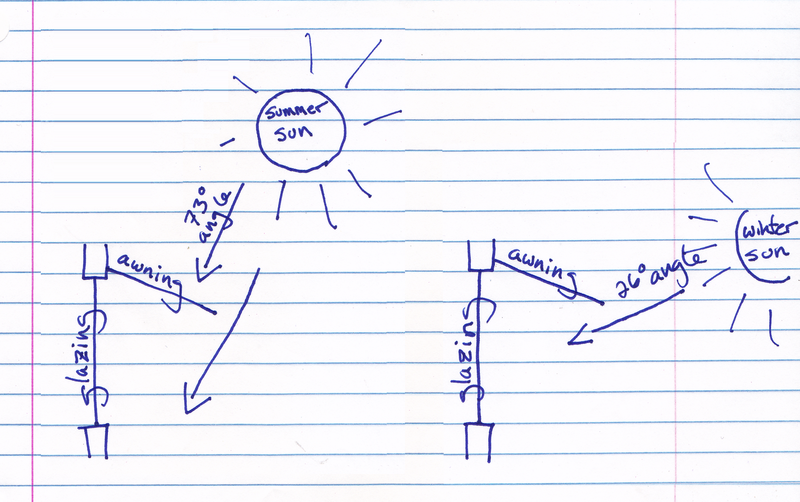 Both of these will allow open window air flows to passively cool the house while blocking summer solar radiation. The leaves of deciduous trees provide shade in the summer and in the winter–when the leaves are shed–solar radiation (and therefore heat) can pass through. We have such a tree in front of our south façade (luckily). Obviously, a tree like this takes years to grow. It’s a good argument for being proactive in planting deciduous street trees throughout the city. Awnings take advantage of the difference between the angle of the sun in summer and winter. In New York, the sun is at 73 degrees at summer solstice, when the sun is most intense, and 26 degrees at winter solstice. The projection of the awning should be great enough to block high angle solar mid-summer radiation allow low angle mid winter sun in. We have to address the question of what kind of awning is aesthetically appropriate for the building later. 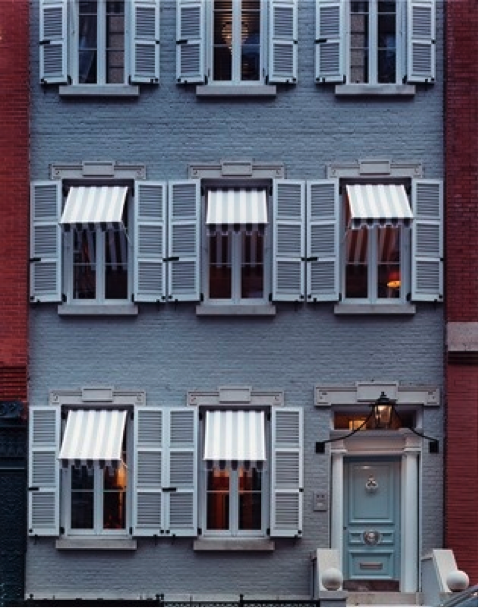 Here is an inspiration photo I found of a masonry townhouse with new awnings. Awning inspiration – a little cheesy though – still exploring better solutions. 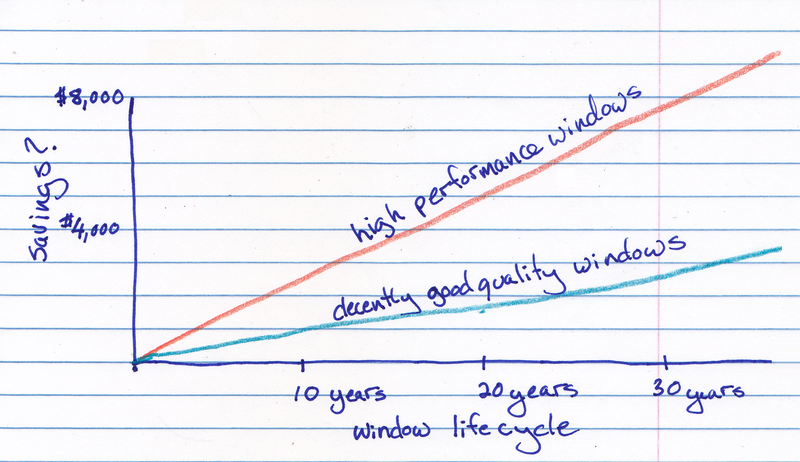 The other key metric of high performance windows is their u-value. U-value measures the level to which the windows are able to keep the heat (in winter) or the coolness (in summer) inside. The lower the u-value the better insulated the window is. In general we are trying to get the lowest u-value window that we can afford. But as always there are trade offs. 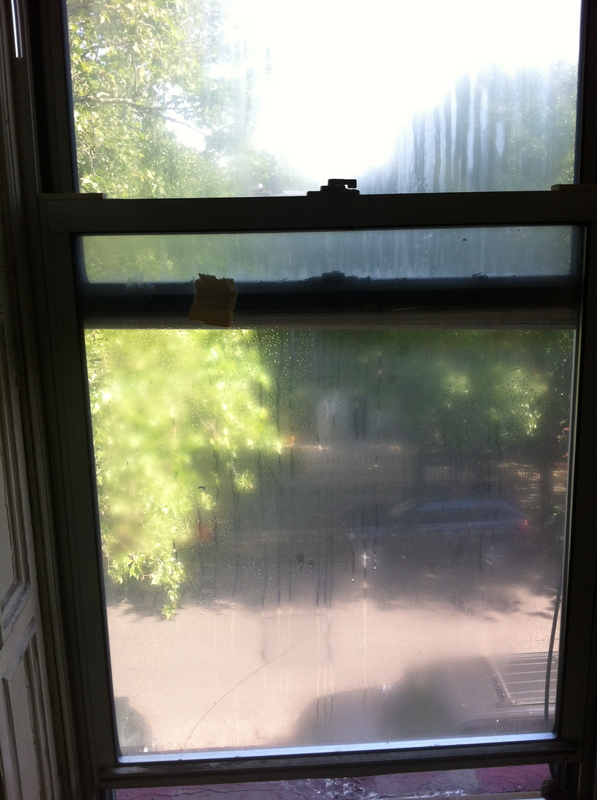 At some point the cost of the window may be higher than the energy savings for any foreseeable time horizon. And even if it does pay off in the long run, maybe that extra money would be better spent on “active” technologies such as solar panels. I don’t have the answer to these questions yet. But I have been playing with some window modeling software and came up with some very broad figures. For the baseline, I modeled average aluminum frame double-pane windows. Vinyl-framed decent high quality windows (blue line) had about $1,400 savings over 20 years. The super high performance triple-pane windows (orange line) had about $5,040 savings over 20 years. Now we have to spec out the prices for these windows and find out if the total incremental cost of superior windows is less than the savings. These numbers are preliminary because the software could not model exactly for our house and our proposed thermal envelope. I am hoping the cost savings will be even higher when we get some more precise modeling. But if you want to try this on your own you can download the software for free at http://windows.lbl.gov/software/resfen/resfen.html. I love the hand-drawn graphs on this blog. They’re a good way to convey information, of course, but it’s nice to see something personal rather than computer-generated. 6% of south glazing might be a rational solution, but not a liveable. Brings less light and within less good atmosphere. We are living in a bad insulated 60ies house, with its main facade to south (bit S-E) In winter sun is warming our house with its big door-windows. We love that bright sunny atmosphere in our house in wintertime (it warms our hearts and helps us to come through cold winters without a depression). If you live in a not very foggy area you really will have a decrease of heating with the winter sun. In summer you have, as I understood, a huge platane-tree, which brings shadow – great. Here Heinz’ comment (my husband, who has been with us on Bettina’s tour) as an advice: try to get a good insulation with a new roof (which you have to renew, I understood) and on your cellar plafond. Than new windows, but no south facade insulation and a new geothermal heating, which you install in your backyard garden. That’s an investment, we would prefer in Europe, even if it costs more at the beginning – but we don’t know, if that technology is advanced and affordable in NYC (And we don’t know anything about gas price-policy in NYC). Wish you the best for your adventure, which is for sure exiting, but also a hard-won goal, but finally exhilarating – I’m sure. 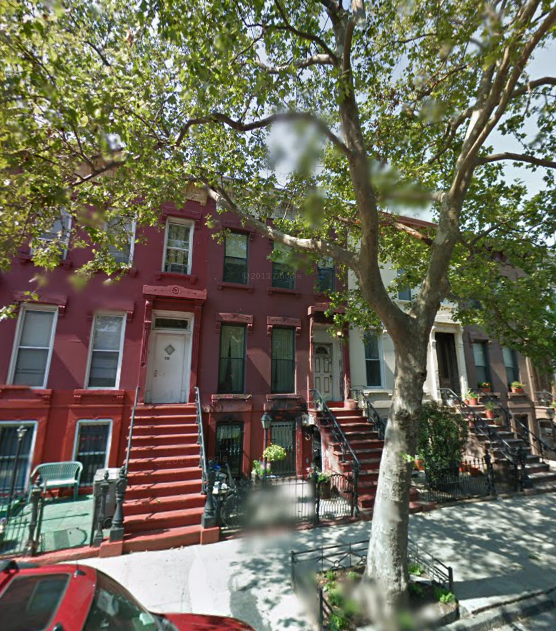 Enter your email address to follow green stuy blog.